Raiz(Chile) Maule Valley Sauvignon Blanc 75cl, Dried Sea Cucumber(海参) 400g Premium Gold Rose Bud Tea(金玫瑰茶) 100g, Grandma Wild's(UK) Cherry & Almond 150g, Grandma Wild's(UK) Choc/Chip Shortbread 150g, Cordycep Flower Sinensis(蟲草花) 60g, Cheong Hoong Fillet Anchovy Cracker 130g, Cheong Hoong BBQ Fish(烧烤鱼片)120g, Butler's Grove(UK)- Strawberry & Apple Preserve 340g, Butler Grove's(UK) Orange Marmalade with Pomegranate 340g. Next day delivery applies for order made before 12pm on a working day for delivery within Klang Valley (Kuala Lumpur, Selangor, PJ etc). For outstation deliveries within Peninsula Malaysia where delivery will be made via courier, at least 3 working days are required. For queries, call +603-78830233 / +6012-6915200 or email sales@gift-lab.com. 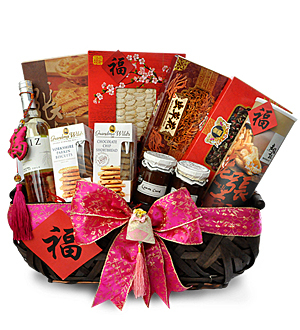 Food Gift Hamper is ideal as a Congrats Gift, a 'Well Done!' Gift or simply to say 'Thank You' or 'You're appreciated'.